“VR will be big, AR will be bigger and take longer.” What sounded revolutionary when we first said it two years ago has become accepted wisdom. But now the market has actually launched, and we’ve got 12 months of real-world performance and major tech players’ strategies emerging. And that’s changed our views on VR/AR growth. A lot. Our new base case is that mobile AR could become the primary driver of a $108 billion VR/AR market by 2021 (underperform $94 billion, outperform $122 billion), with AR taking the lion’s share of $83 billion and VR $25 billion. Let’s start with the less than happy times. Facebook (Oculus Rift) and HTC (Vive) had growing pains at launch, whether slower than expected shipping or order cancellations. Oculus launched without Touch controllers, which eventually cost $199 instead of being bundled (i.e. non-PC full system costs hit $798 — the same as HTC Vive). Samsung’s Galaxy Note 7 saw part of its mobile VR ambitions literally go up in smoke, as the new Gear VR was designed to be compatible with that flagship device. Magic Leap also received a boatload of speculation about the tech it used to raise $1.4 billion. Thankfully Nintendo/The Pokémon Company/Niantic had a breakout success that even they didn’t anticipate. Pokémon GO delivered $600 million in mobile AR revenue in its first three months alone, making more money through the year than the entire VR games software market in 2016. While this came from a very specific set of circumstances, there have been direct knock-on effects for major tech companies’ mobile AR strategies. As well as Sony’s solid launch of PlayStation VR, the quiet achiever last year was Google. It launched its Daydream View mobile VR headset/controller and the first Tango mobile AR phone. What helped even more was Snap’s genius launch of Spectacles, which made wearing goofy future glasses cool again (no more Glassholes), even though it isn’t really AR. 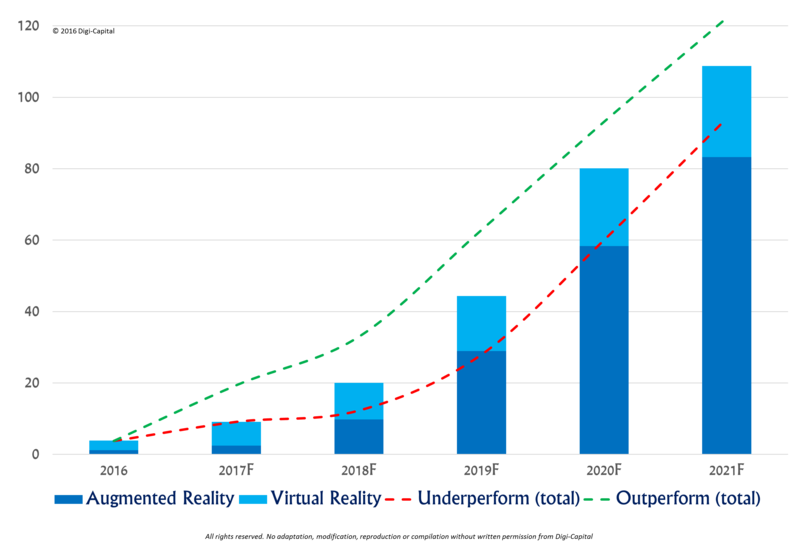 The absolute performance of VR/AR in 2016 was not as important as how it changed the trajectory of the market. Where at the start of the year we thought 2016 could deliver $4.4 billion VR/AR revenue ($3.8 billion VR, $0.6 billion AR), the launch year’s issues resulted in only $2.7 billion VR revenue. This was counterbalanced by Pokémon GO’s outperformance helping AR to an unexpected $1.2 billion revenue, for a total $3.9 billion VR/AR market in 2016 (we were 11 percent optimistic). But the last 12 months have fundamentally reshaped how the market could grow going forward. Mobile VR will still produce the dominant “Explorer” (free-$100) installed base for VR, with Google Daydream View moving things on from Cardboard days. However, Samsung’s troubles last year meant that mobile VR didn’t get off to the flying start it could have. A smaller installed base than expected in 2016 reduces the network effects that platforms need to scale, which could slow things by 6-12 months. Mobile VR is still going to be big, but it might take a little longer to get there. Mobile VR is still going to be big, but it might take a little longer to get there. Sony’s PlayStation VR launch and Microsoft’s upcoming Windows 10 VR headsets are the boosters VR needs, with consumer price points and performance that work for an “Enthusiast” (less than $400) market. Microsoft’s offering, with inside-out tracking (inherited from HoloLens), is a game changer at a $299 price point. Plus, it doesn’t need a brand new PC to run it, which makes it a genuine consumer product. Facebook and HTC’s higher-priced offerings and platform requirements are at risk of being squeezed into a low-volume “Specialist” (less than $1,500 total system cost, including platform) market by Sony and Microsoft. A deep niche populated by whales, but one that could become a narrow trench unless something can be done about price. In response to Pokémon GO, Apple’s Tim Cook said that Apple is “high on AR in the long run…continue to invest a lot in this…AR can be huge.” Google’s Sundar Pichai, Facebook’s Mark Zuckerberg and Microsoft’s Satya Nadella also hailed Pokémon GO as a major early win for AR. While most attention is paid to what that hero device will look like and when it will get here, two of the other challenges are particularly hard to solve. Until there’s a major breakthrough in battery technology, a lightweight pair of AR smartglasses doing heavy-duty AR is hard to power all day without a battery pack or hot-swappable batteries (which are fine for enterprise customers, but a harder sell for consumers). This is a non-trivial problem. Plus, it’s a major risk for the developer ecosystem to invest heavily in building apps for new platforms until the installed base reaches scale. It’s the perennial chicken and egg problem that all new tech platforms face. So where does this leave titans like Apple, Google, Facebook and Microsoft, and all the high-growth AR smartglasses startups? Smartphones solve four of the major challenges for mass consumer AR already: all-day battery life, mobile connectivity, app ecosystem and telco cross-subsidization. Plus, you’re probably reading this on a hero device (iPhone, Samsung or other great Android phone) — it just doesn’t have the sensors and software to be a full AR phone. Yet. Pokémon GO is a thin lens into the potential of mobile AR (even if industry insiders don’t like to call it that). The first step to true mobile AR was taken when Google launched its Tango AR phone with Lenovo. While that doesn’t look like the hero device mobile AR needs to take off yet, it points in the direction of the tech that Apple, Samsung and others could use to revitalize innovation and growth in the slowing smartphone market. And this is where mobile AR’s secret weapon comes into play: replacement cycles. 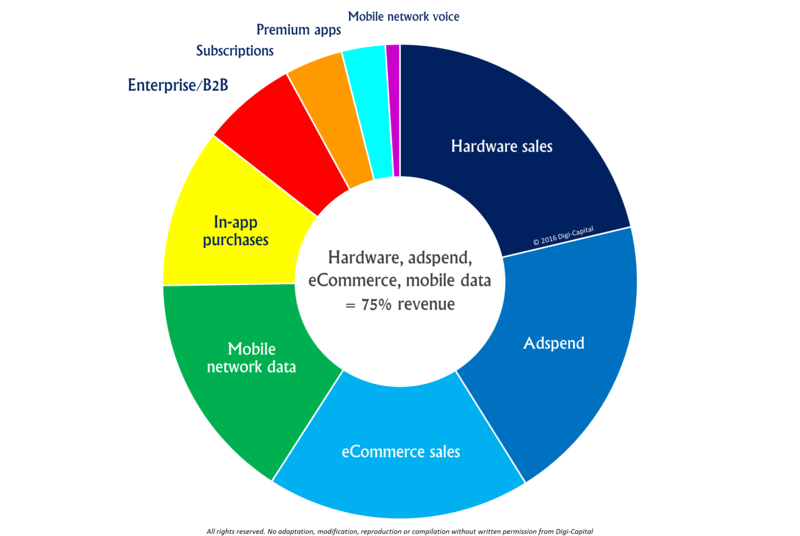 Most developed mobile markets have hit saturation, with sales coming from consumers replacing their phones regularly despite not really needing to. It’s just something that we do. But that replacement cycle has been edging up from under two years toward three years, which is a major headache for Apple, Samsung and others. After nearly a decade of outperformance, Apple saw declining iPhone sales and revenue last year. Samsung’s Kim Gae-youn said it could “secure a baseline profit even if the market stagnates, so long as we don’t make a bad mistake.” And that was before the Galaxy Note 7. Smartphones are a mature market, crying out for innovation to rekindle growth. Apple is the best-placed of all major tech companies to potentially drive mobile AR. So it’s no accident that Apple bought Metaio, with speculation in the industry of the core team working in secret deep inside the company. Similarly, Samsung’s Sung-Hoon Hong has talked about its “light field engine” that can produce “really, really realistic” holograms that look “really touchable,” and how augmented reality has “much better business development” potential than virtual reality. Qualcomm’s Seshu Madhavapeddy said that its flagship processors could enable phone-based AR with significant battery savings and smaller form factors. Neither Apple nor Samsung has said anything specific about their mobile AR plans, but our base assumption is that they could launch AR-enabled phones in 2018 (outperform 2017, underperform 2019). Other major phone makers might join them. While there is a chance this could happen in 2017, if an iPhone 7s and Galaxy S8 turn out to be standard phones this year, then next year the iPhone 8 and Galaxy S9 could become the dawn of mass mobile AR. The beauty of this approach is that it doesn’t require consumers to do anything they don’t already do — just replace their iPhones and Samsung phones as usual. If they get everything right, AR phones could become the new hotness to drive mobile growth again. Who wants an old smartphone when you can have a magic window on the world? But where (or rather when) are the “true” augmented reality smartglasses we’ve been promised? While you’ll be able to buy your smartglasses from ODG, Meta and others this year, AR smartglasses’ five big challenges might not all be resolved before 2019. Smartglasses leaders could remain focused on “Enterprise” (>$1,500 total system costs) and consumer “Specialist” (<$1,500) markets until they are able to completely replace your smartphone without a battery pack and also offer a full app ecosystem. For the next few years, standalone smartglasses could build a deep high-end market as discretionary purchases independent of the phone you’re going to buy anyway. Smartglasses’ inflection point could come when they begin to cannibalize smartphone sales outright. Apple, Samsung and others could become smartglasses players later (unless Robert Scoble was well-informed) as a natural progression from mobile AR, potentially launching them as phone peripherals like smartwatches (only this time cool and disruptive). Google, Facebook, Snap and China’s BAT (Baidu, Alibaba, Tencent) could also have big roles to play. While the market could play out in many ways, let’s look at what major players’ strategies might be. Things could turn out differently, so we’ll revisit as we learn what is (and isn’t) happening. Facebook is the largest single investor in VR/AR after buying Oculus for $2 billion and investing at least $500 million more. The company began telegraphing what might come next by splitting Oculus into PC and mobile divisions and showcasing two different VR social platforms. Oculus’ PC VR division looks set to remain in VR “Specialist” and “Enthusiast” markets because of price, so increasingly doesn’t look like a Facebook-sized (i.e. hundreds of millions to billions of users) asset. Facebook could keep the Oculus PC VR division as a high-end test bed to support mobile VR/AR efforts, or spin it out (like Niantic from Google), merge it (potentially consolidating the high-end PC VR market) or sell it outright. Oculus’ mobile VR division is in a prime position to continue running Samsung’s Gear VR app store and drive Gear VR innovation. Mark Zuckerberg has already said he believes in mobile AR, but as a non-phone maker, Facebook could stick to its roots as a software player in that market. Given its track record as a Snap fast follower, we might end up wearing Facebook “Spectacles” too. Apple is the best-placed of all major tech companies to potentially drive mobile AR, with its end-to-end ecosystem of hardware, software, app store, developers and retail. The company has been characteristically enigmatic despite Tim Cook’s stated enthusiasm for AR, but all it needs are a few additional sensors, integrated Metaio software and some serious intent. As above, our base case sees this happening next year (outperform 2017, underperform 2019). For Apple customers, there would be no marginal cost to buying an AR-enabled iPhone — they’re going to buy one anyway. Nurturing a growing ecosystem of apps and developers is second nature for Apple, so in the long run, smartglasses as an iPhone peripheral might be a logical next step from Apple’s mobile AR efforts. It doesn’t look like Apple will disrupt itself with standalone smartglasses to replace your iPhone just yet (again, unless Robert Scoble was well-informed. If so, our outperform case comes into play). Samsung is likely to remain a major player in mobile VR, despite what happened with the Galaxy Note 7. But it’s not a full ecosystem play for mobile VR because Facebook runs its Gear VR app store. Samsung could stick to its hardware roots with mobile AR using similar timing to Apple, with others driving app stores and software in that market, as well. Also like Apple, AR smartglasses as a Samsung phone peripheral could become a logical progression from mobile AR long term. Microsoft’s Satya Nadella focused HoloLens AR/mixed reality on the Enterprise market because of its high spec and price, and going mass consumer doesn’t look likely in coming years. So while you could play Minecraft on HoloLens, you’ll only do so as part of “research” at work. Microsoft’s Windows 10 VR is a game changer for the PC/console VR market with its inside-out tracking, low price and basic platform requirements, and the company is staying true to its Windows playbook with partners HP, Dell, Lenovo, Acer and Asus making the hardware. There’s also a good chance Xbox One Scorpio will see a Windows VR headset bundle at launch to drive console VR growth. Yet despite all its assets, Microsoft doesn’t have a focused mobile VR/AR play apart from Minecraft (a big game, but not a platform). Until a clear strategy emerges, Satya Nadella’s Microsoft risks missing the mobile VR/AR platform shift in the same way Steve Ballmer’s Microsoft did with phones. After its misadventures with Glass, Google is doing the Googliest thing possible for VR/AR — everything. For VR “Explorers,” Cardboard is a low-risk entry point for VR and Daydream View could become the mobile VR leader (whether made by Google or others). Google’s approach with Tango (both in-house and with hardware partners) is at the forefront of the impending mobile AR revolution. However, Apple versus Google in mobile VR/AR could end up looking like iOS versus Android: Apple with a hugely profitable end-to-end mobile AR ecosystem, Google enabling a larger open mobile VR/AR ecosystem to drive its core search advertising and Google Play revenues. A good result either way. Speculation about a merged Tango/Daydream standard using Tango sensors for VR might require a new form factor to the current closed-back Daydream View, and it’s still too early to make a call on a potential Google Glass 2. The console/PC VR market should also see Sony continue to drive core games revenues with PSVR, while HTC’s Cher Wang could consider how to make the HTC Vive more accessible to a mass consumer audience in terms of price. 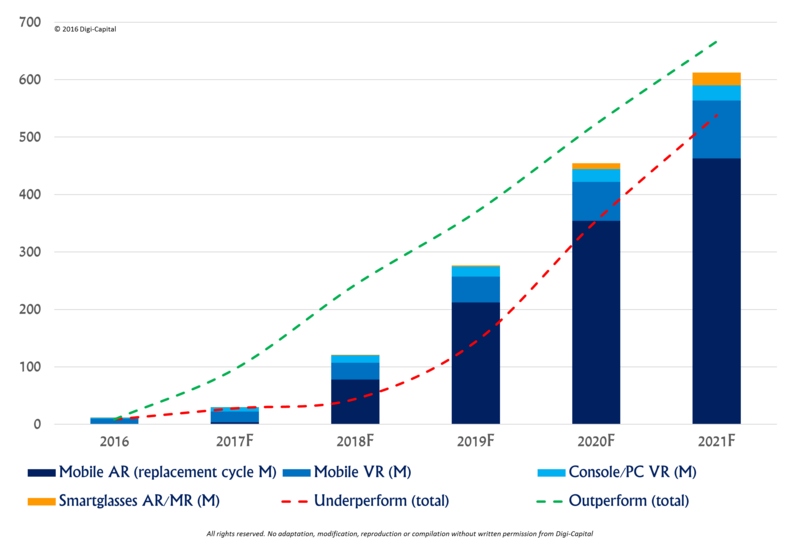 HTC might also adopt a Facebook-style dual PC/mobile VR strategy and enter mobile AR, but would need to grow its core phone market share to scale. Intel’s Project Alloy all-in-one VR headsets also look set to shake up the VR “Specialist” market when they launch later in the year. And what about all the exciting VR/AR startups (now including Snap)? More on that next time, but from here, the only way for VR/AR is up. Roll on 2017.